Kudo’s to the IDF. Next stop nr.4. 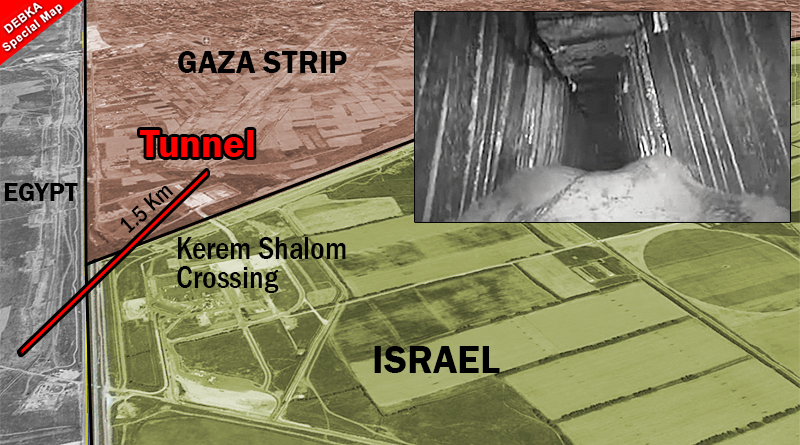 The picture shows the tunnel passing under Israel, not into Israel. So what gives? I don’t the point of your question. Are you asking why did the tunnel run under Israel and not just under Gaza and Egypt? Or are you asking why was it destroyed? The story indicates the tunnel was used to smuggle materiel into Gaza. That gives Israel, the intended target of such munitions, strong reason to close it. We now see pictures of ISIS slitting the throats and shooting Hamas agents. ISIS don’t like how conciliatory the Hamas barbarians are and want all out war today with Israel. I think that prospect of wild ISIS beasts in the Sinai region will either mean a terror war inside Gaza between ISIS and Hamas or it will push Hamas to do something very stupid against Israel which will mean that Gaza will be made into a nice beach of glassy sand for the European contributors to terrorism in Gaza which they will be able to visit during their vacation getaways from jihadist attacks in Europe. Did the IDF destruction of the Hamas tunnel interrupt the flow of oil and gas into Gaza? Why? Why? Who cares why! The innocents (if there are any) suffer due to the actions of the sick demented jihadi terrorists….why is that so hard to understand? Blessings of Hashem upon the IDF! This Tunnel was meant to circumvent the Egyptian anti tunnel system along the Egypt Gaza border by crossing through a corner of Israel where the anti tunnel system does not exist. Israel should take out a few Hamas leader’s mansions as well. The supplies to Gaza come from Egypt. Other sources report a tunnel spur that was not completed but designed to lead into Israel. Hence Israel’s concern. These two-legged rats are almost as resourceful as their four-legged relatives – and must be treated as such ! Notice the concrete walls in the article’s picture of the inside of the tunnel. That concrete was being supplied to Gaza as part of a humanitarian effort to rebuild damaged civilian structures. It looks like Hamas and Islamic Jihad found another use for it. Has anyone updated the Europeans and Turkey about this——or do they already know and do not care? Good job, Israel! Keep up the good work. to Gasa. And build sandwitch board based structures as shelter for civilians. Light building only. So nobody can build tunnels with boards made of sheet metal steel and polyurethane. The people on the hill tops in Juda and Shomron build like this. It is sufficient for dwelling so the arabs in Gaza should be contend with it too. Also for “technical reasons” block the gas line as it might have been damaged by dismanteling the tunnel an take many months for safety tests and inspections before opening it again or keep it closed as inspections revealed a savety problem while rebuilding is too expensive or impossible for other ressons.